Interviewer: Were the gigs in the early days really scary? Nick Mason: No, not really, we got jolly annoyed but we weren't really scared. We just went on and on and on. We never said, 'Damn this, lets pack it in'. We just trudged around for a daily dose of broken bottle. Roger Waters: Where was it that we actually had broken beer mugs smashing into the drum kit? Nick Mason: East Dereham, and The California Ballroom, Dunstable. Roger Waters: The California Ballroom Dunstable was the one where they were pouring pints of beer on to us from the balcony, that was most unpleasant, and very, very dangerous too. 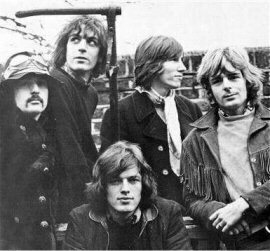 The Floyd gig took place at the California in the days when the Ballroom had two stages. They obviously appeared on the stage immediately below the Vista Bar.